Liz and her husband hope to help other travelers by sharing their experience of hotels they have stayed in across a range of star ratings. 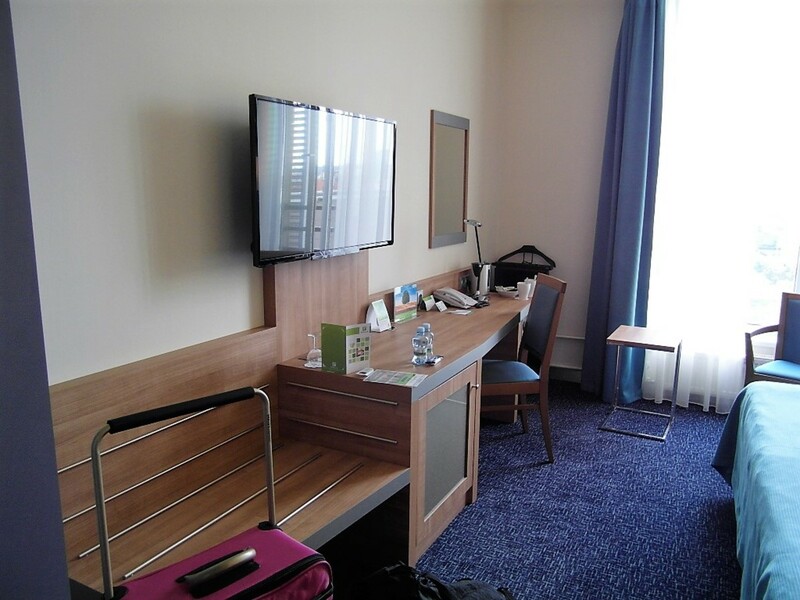 After deciding on Prague as a destination and booking flights, accommodation was next on our list. 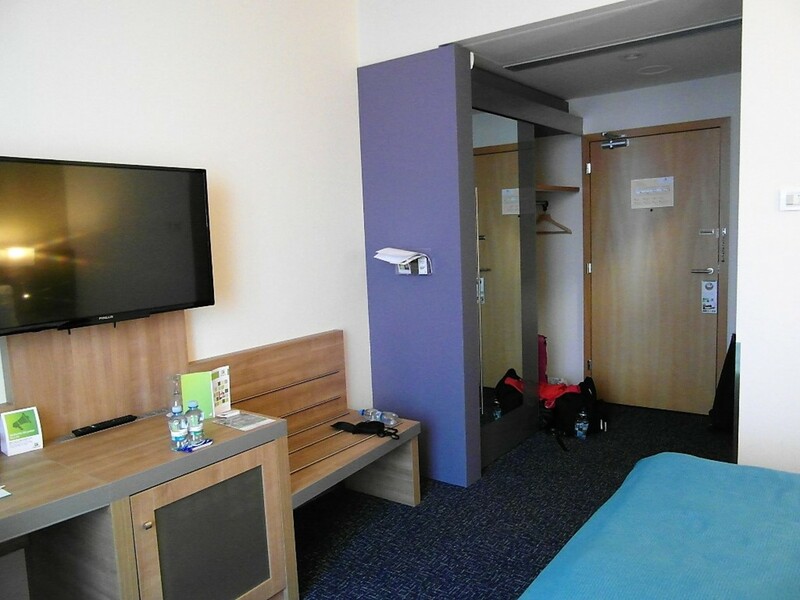 Our Prague trip was slightly unusual, as it was structured around free stays in the middle in two top-class hotels. But we needed to find a base for the nights before and after. 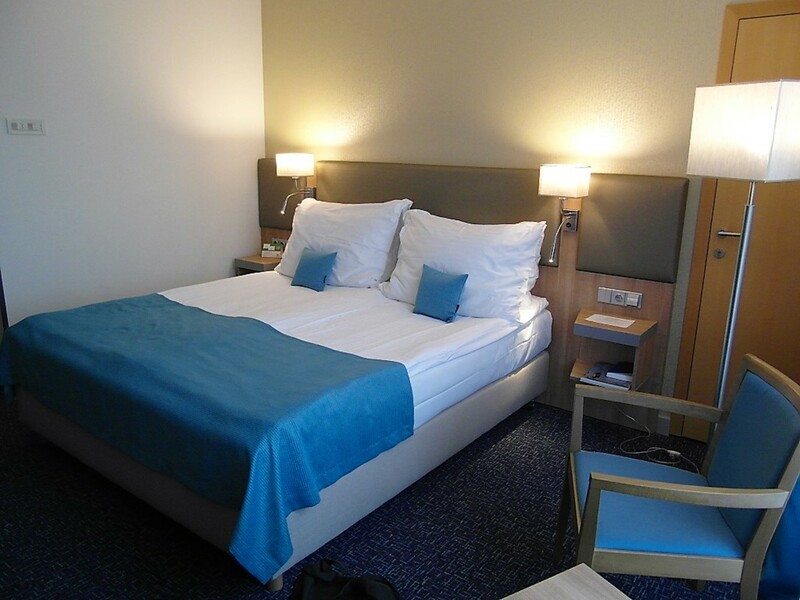 Holiday Inn Prague Congress Centre ticked the box on three criteria. It was in a good location, within 5 minutes walk of a metro station, which got us into central Prague within minutes. 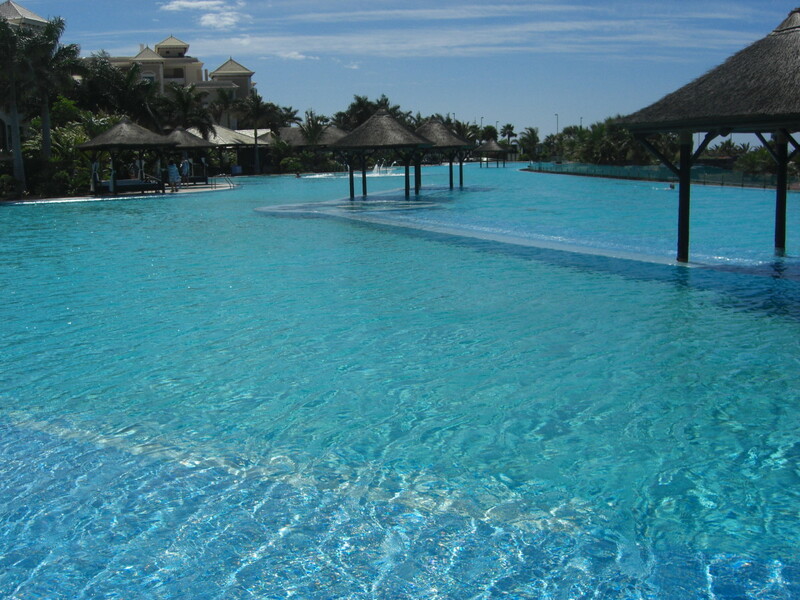 It came at a good price, with a very favorable IHG rewards points rate per night. It had an executive lounge, which we could access for free food and non-alcoholic drinks if we got upgraded to an executive room. 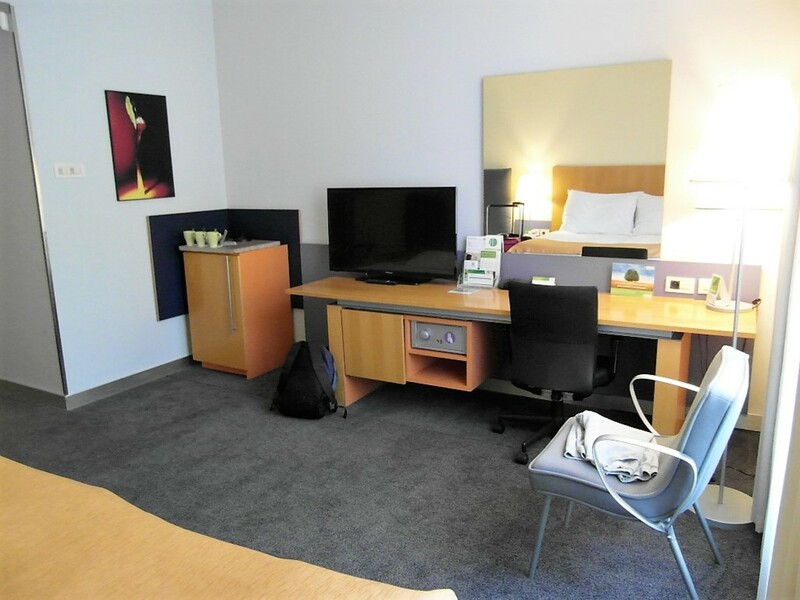 After a night at Holiday Inn Prague Airport when we arrived in the Czech Republic, we were pleasantly surprised how easy the transfer to Holiday Inn Prague Congress Centre was. We took bus 100 to Zlicin, where we picked up the metro (line B/ the yellow line) to Florenc. Here we changed onto line C/ the red line in the direction of Haje. We got off at Vysehrad and, as we came out of the metro station, we saw the Congress Centre in front of us. Holiday Inn Prague Congress Centre is located around the other side of the Congress Centre. 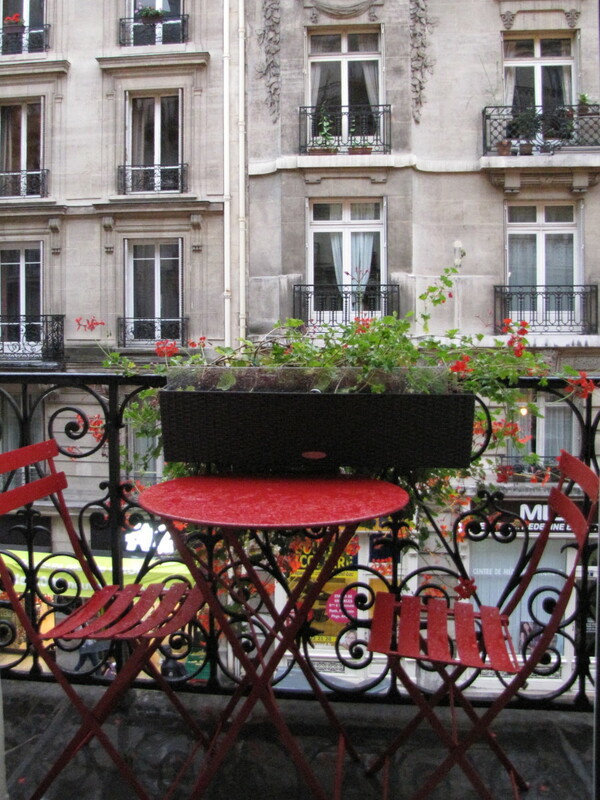 It usually took us 5 minutes to walk from the hotel to the metro, slightly longer with luggage on arrival. As we passed the Congress Centre, we came to a large granite-faced building of 6 floors, with a lower wing at right angles. We were reassured to see the recognizable Holiday Inn logo. Although the hotel looked out over the entrance to an underground car park, an attempt had been made to disguise this with a large border area of shrubs as well as a number of large plant pots near the entrance. There was also a row of flags in front of the hotel. We passed a coffee shop, serving light snacks on our way to the canopied front entrance. The lobby area was entered through automatic revolving doors. There was a table with a jug of water, flanked by tall plant pots and interesting plastic floral arrangements. To the right, there were low-slung modern chairs and also some cash machines. A modern reception was located along the back wall. The grey tile floors of the entrance area gave way to a well worn wooden floor to the left of the entrance. Tables with chairs covered in grey or cream material had been placed here as an overspill seating area from the bar, which was located further in, towards the rear of the building. 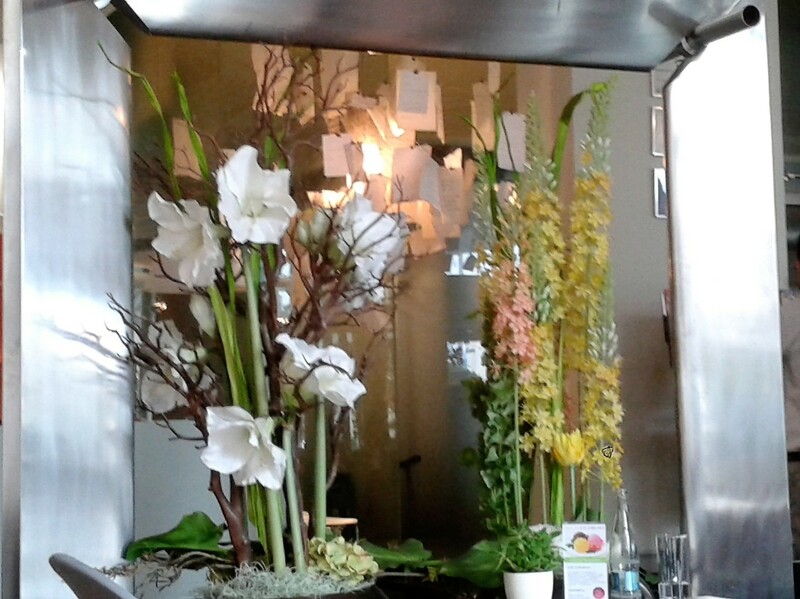 An interesting silver-framed floral display divided the seating off from the main reception area. 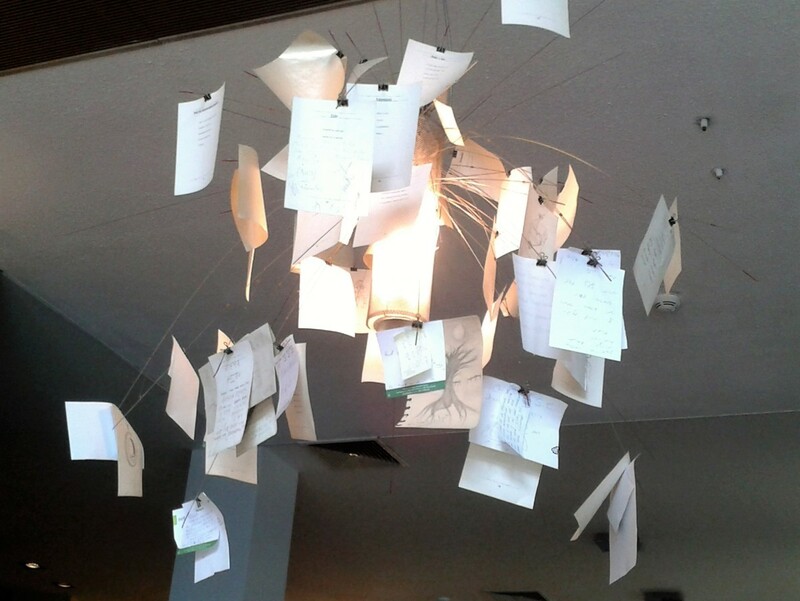 The low hanging lights were also a little unusual in this area, as they had a collection of handwritten thank you notes hanging from them. There was a grand piano in the bar area. The artexed ceiling appeared a little dated, as did the old air conditioning vents. 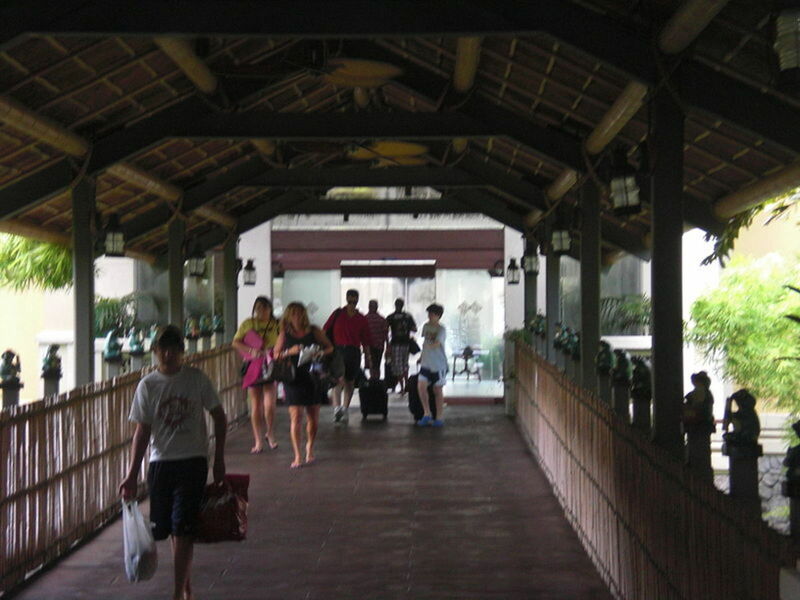 We could see an entrance to the restaurant and a conservatory area beyond, at the back of the hotel. Arriving at 11.30am, we were a little early for the 2.00pm check-in. A very efficient trainee explained that our room would probably not be ready, but that we could store our luggage. 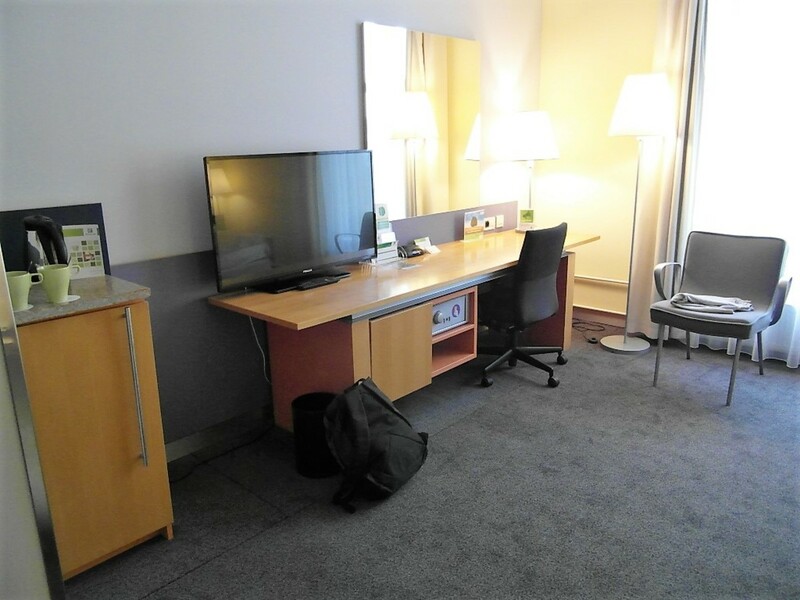 He confirmed that we had been given a complimentary upgrade to an executive room, due to IHG Rewards Club status. Our room turned out, after all, to be ready. Our executive room keycard would also unlock the door to the executive lounge, which was music to our ears. We were directed towards the lifts beyond the bar area. If you plan on staying in InterContinental Hotel Group hotels, it is worth joining the Rewards Club. Membership has its benefits, such as reduced stay rates. As you go up the tier status, the benefits increase, with potential free room upgrades. It is also worth researching relevant credit cards, which can boost your tier status. Room 536 was, as the number suggests, on the 5th floor of the main building. The corridor was wide, well lit and decorated to a high standard with a good quality carpet. The wide oak door of our room was unlocked with a touch of the key. To the left was a narrower wooden door into the bathroom and to the right the wardrobe area. Beyond, there was a desk area, with the bed facing it. A tall window around 40cm off the ground looked out over the front of the hotel. The UPVC window opened to the side, restricted by low bars and an external metal shutter-effect decoration. There was an inter-connecting door in the far corner. The fitted wardrobe area had a sliding mirror door halfway along with a vertical chrome handle. A shelf ran along the top and hanging spaces were split into a tall and slightly shorter one. There were also 5 small shelves. The rest of the fitted furniture in the room was in a pale wood color with grey trim. A good sized wooden suitcase holder with chrome ribs on the base, backing and to one side, started off the desk/dressing table unit with a useful gap below it. Below the moderately-sized desktop, there was an opaque glass door into a pricey, but well-stocked mini bar. On the wall behind, wooden backing led up to a decent-sized flatscreen TV. A high-backed, wooden framed chair with a padded back and seat stood at the desk. This was matched by an armchair in the opposite corner. A chrome-based single side support coffee table with a wooden top was in front of the window. The bed was king size on a base with low wooden legs. There was a wooden fitted headboard with three sections of padded cushioning and a grey-trimmed shelf on each side. Three walls were painted cream and the one behind the bed was papered in a beige color. Aside from this, the dominant color was blue. The pattern of the carpet was in shades of blue and the frame of the wardrobe was in a dull blue. The material on the seating was in a turquoise blue. The blue theme was picked up by two small cushions on the bed and a throw across the bottom. At the window, there were full-length white net and also blue curtains, which were effective at keeping out the light. The bed sheet, pillows, and duvets (there were two single ones) were white and the bed base was beige. The padded sections on the headboard were covered in a bronze-colored material. There was efficient air-conditioning in the room and also a low radiator below the window. The room was well-lit from several light sources. There was a ceiling light above the main door. A free-standing standard lamp on a chrome base with a cream rectangular fabric shade stood in the far corner. The lamps on either side of the bed had similar matching shades and also had integral reading lights. There was a chrome and black anglepoise desk lamp and also useful strip lighting in the wardrobe. The room was well served with power points. There were three by the desk and three more near the bed. There were 7 hangers in the wardrobe and 3 trouser hangers. I make a note of this because I had a friend who used to pack her case with clothes on wire hangers, ready to be lifted out at her holiday destination. She said that it saved time and that there were never enough hangers in hotels. I often remember her advice when I run short of hangers! The wardrobe was also home to an iron and an ironing board, as well as two bathrobes, two pairs of hotel slippers, a clothes brush, shoe horn, shoe polish, and a sewing kit. There was a telephone on the desktop. The safe located below the desktop was operated by the room key and the bin was positioned below it. A rectangular grey framed mirror was located on the wall above the desktop. A trouser press stood in the corner of the room. In addition to the minibar, we found two complimentary small bottles of water with two small milky way bars on the desktop upon arrival. The room was well-equipped with two wine glasses, two tumblers, and two branded coasters. A full-sized kettle came with two mugs and a bowl containing tea, coffee, fruit tea, sugar and sachets of creamer. When we returned to our room later in the day we were pleasantly surprised to find two bottles of still water, two of sparkling and a quarter bottle (187ml) of Czech red wine. There was also a dish containing peanuts, walnuts, dried fruit and two Prague versions of chocolate club biscuits. 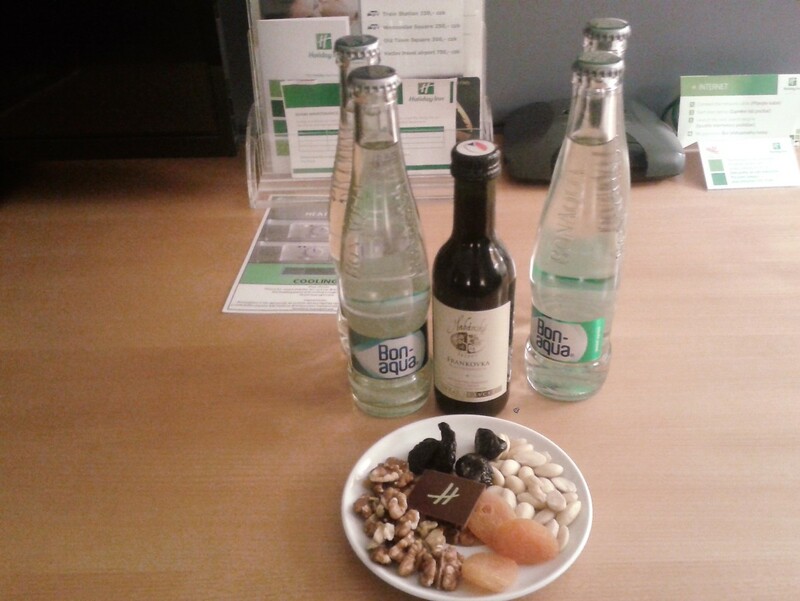 This was accompanied by a letter from the manager, welcoming us to the hotel and hoping we would stay again. There was a turndown service on the executive floors. So each evening we would return to find the duvets turned down, the curtains drawn and a Prague chocolate on each pillow. The room was of moderate size, but it had been tastefully decorated and well-maintained, making optimal use of the space available. 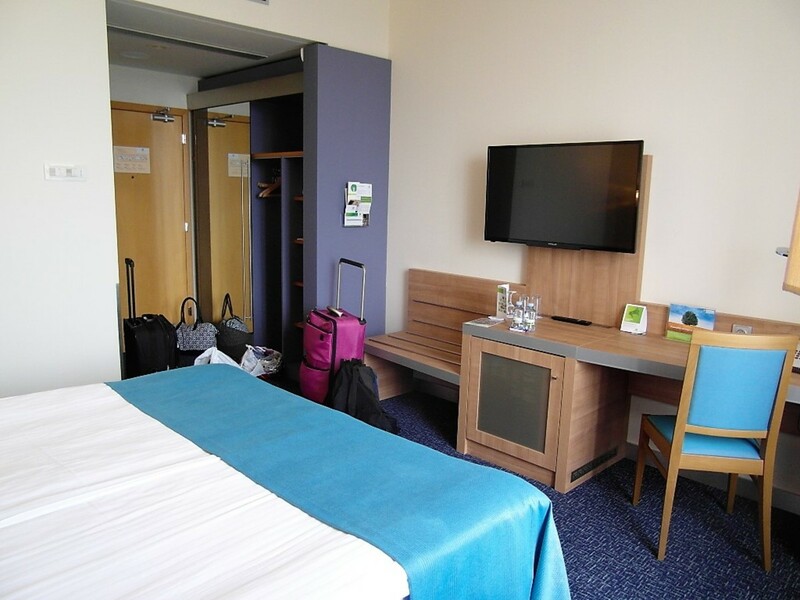 In comparison with other similarly branded rooms, it deserved its executive description. A marble black and grey doorstep was at the entrance to the bathroom. The room had a light and airy feel about it with large cream floor and wall tiles. There were also decorative rows of very small mosaic black and bronze tiles around the edges, near the sink and halfway up the wall. The white bathroom suite looked reasonably modern. The sink and surrounding top were a single unit. There was a large mirror behind the sink, as well as a wall-mounted chrome circular shaving mirror on a retractable support. Tissues were in a chrome wall-mounted holder and there was a hairdryer on the wall nearby. 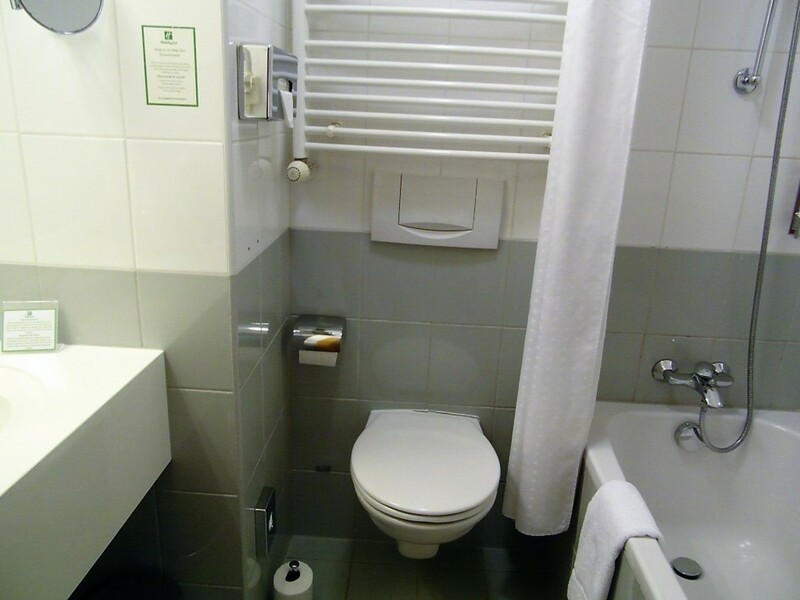 The toilet was mounted on the wall opposite the door with a heated towel rail fixed to the wall above it. The bath had a shower over it running off chrome mixer taps with a hose and shower head on a vertical rail, all enclosed with a partial glass shower screen. 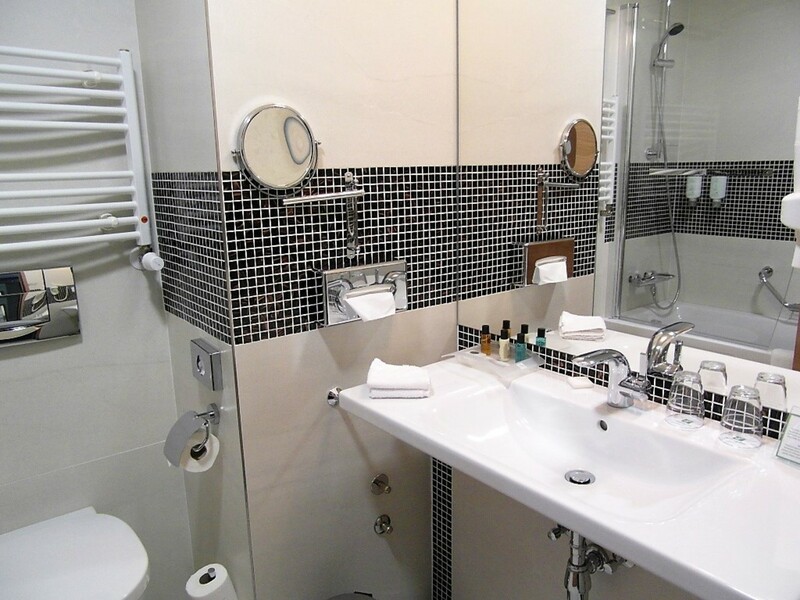 There were chrome racks for toiletries, as well as a grab rail by the bath and a towel rail at the far end. There were some old-fashioned scales (for those who want to track their weight whilst staying in the hotel). A shower mat was rolled up under the sink. 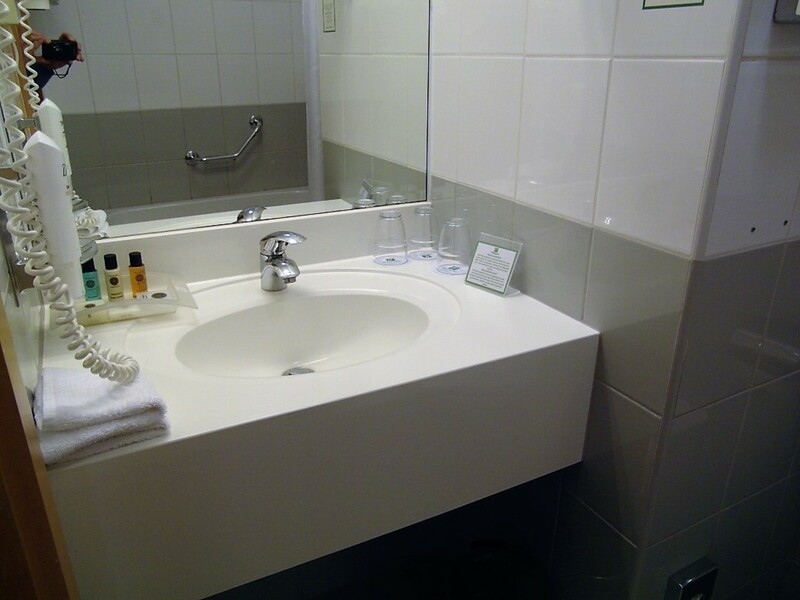 A Laura Hutton soap dispenser was located by the sink and similarly branded soap and shampoo dispensers near the bath. In addition to this, there was a tray by the sink containing three soaps, nail files, shower caps, bath and shower gel, shampoo and body lotion (two of each). There were two hand towels and two bath towels of good quality and generous size, as well as a floor mat/towel. 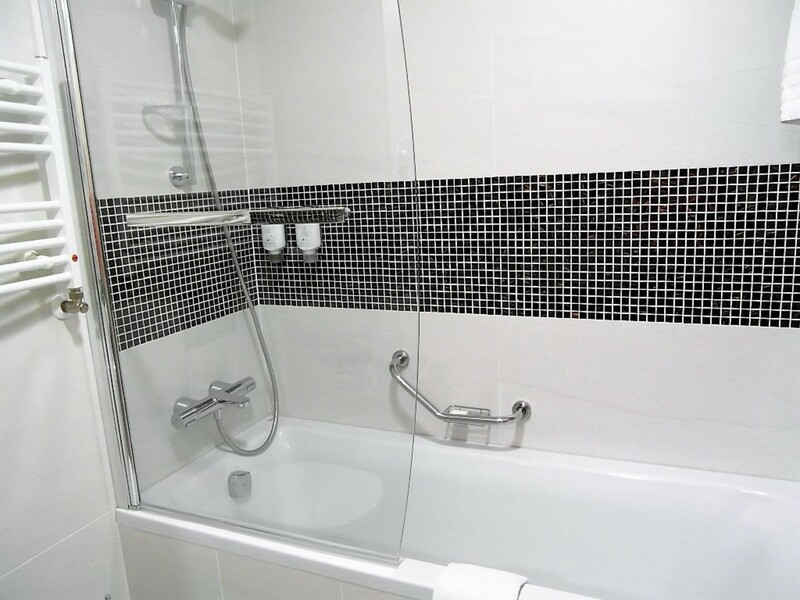 Despite this being a relatively small bathroom for the standard of room, it made optimal use of the space available. The room was brightly lit, well-equipped and decorated to a good standard. As this was the first occasion that I recall staying in a Holiday Inn with access to an executive lounge, we were keen to check it out. So, shortly after arrival, we headed down to the first floor, where we had been told that it was located. I was surprised that it wasn't on the 5th or 6th floor with the executive rooms. I was even more surprised when I saw the first-floor corridor. The carpet was stained and it compared poorly with corridors on the higher floors. I am guessing that in the gradual refurbishment of the hotel, apparent from the website, that this will be put right. We gained access to the lounge with our room keycard. The initial impression was disappointing. The lounge consisted of a moderately sized room, containing a sofa, two square wooden tables, pushed together, with six high-backed chairs around them, a further table along the wall and two units with two small fridges on top of them. The first thing we noticed was the amount of uncleared, used crockery. Upon further exploration, we noticed that one fridge contained bottled water, juice and coke and the other a selection of sandwiches. There were more soft drinks in a drawer. On top of one unit, there was a facility for making hot drinks, a selection of cutlery, crockery, cups, and glasses as well as cakes and fresh fruit. 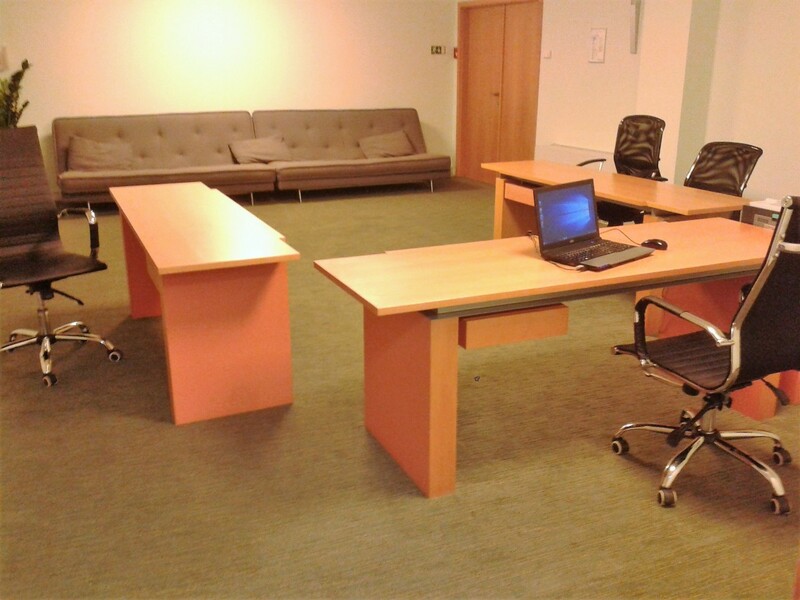 We also noticed access to a larger meeting room, which had three desks, four large swivel office chairs, two sofas, a laptop, and a printer. The latter was useful at a later date for printing off our boarding passes for the return flight. Despite our initial disappointing impressions, we made good use of this room during both our stays. Returning later on day one, we were encouraged to find that all the dirty crockery had been cleared, the fridge had been restocked with fresh sandwiches and there was a selection of apples, pears, and satsumas as well as more cakes. We got accustomed to a routine of stopping by in the morning for a coffee and snack, grabbing some soft drinks for the day, before setting out sightseeing. On our return, we would often stop by the executive lounge for a light meal of sandwiches, fruit, and cake. This was a rare trip abroad when we didn't need to buy any bottled water. When supplies were running low, a quick call from the phone in the corner of the room to reception would result in a staff member appearing reasonably promptly with more food. This worked well until the day when we got back later than usual, only to be told that food was not available after 8.00pm We later found a notice under the sideboard, saying that food was available from 10.00am until 8.00pm. This was not the best executive lounge I have ever been in. Our best experiences have been in Crowne Plaza and Hilton hotels. But we considered it a bonus in a Holiday Inn and certainly better than nothing. After accommodation, refreshments come next on the list. 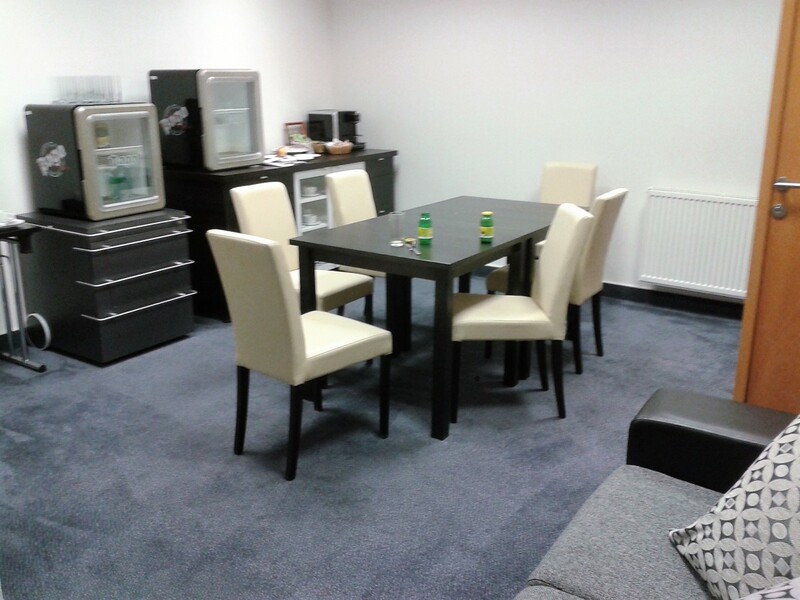 Whilst the executive lounge was a bonus, it did not cover all of our food and drink requirements. We were offered the option of breakfast at check-in for 16 Euros each, which we declined. We had brought cereals from home, as well as disposable bowls and spoons. All we needed to buy was some long-life milk from a convenience store on a neighboring road or from a small supermarket in the Muzeum metro station. Obviously, the executive lounge fell a little short of providing a main meal. As we tend to find dining in hotels is not the cheapest option, on day one we enquired at reception about nearby dining options. We were told of three nearby choices. There was a restaurant opposite the hotel, an Italian and a restaurant at the side of the hotel, serving food all day. We opted for the latter, V Case, a Czech bar, where we enjoyed stuffed rabbit, chicken risotto and apple strudel with cream, washed down with Czech wine or beer for a total of 549 Czech Koruna. We planned on returning but never made it, as we ate out in Prague the other days, whilst sightseeing. 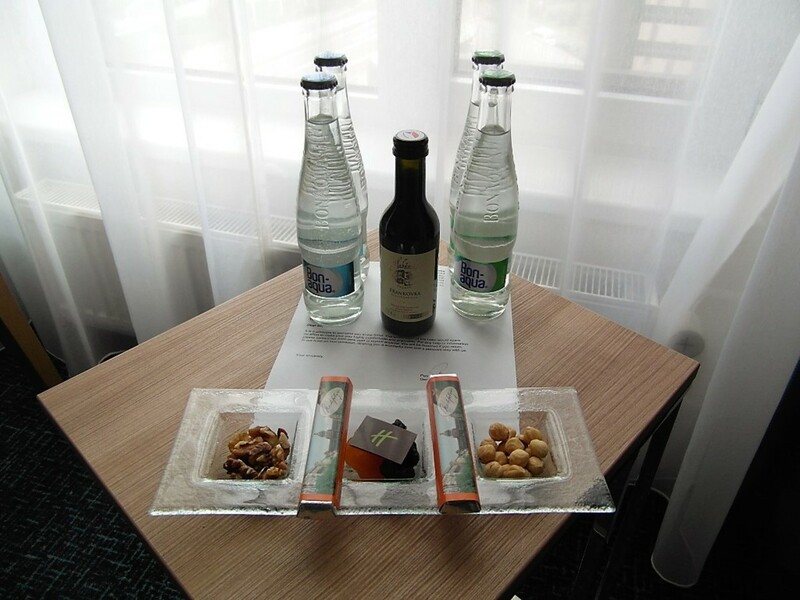 As is customary in InterContinental Hotel Group hotels, we were offered the choice of drinks vouchers or welcome points, due to IHG Rewards Club membership. We chose the former and later on day one, duly headed down to the bar. Unfortunately, the experience did not match our expectations. The staff were unfriendly and deliberated at length over the vouchers. Eventually, we were given a glass of wine and a beer. There were no crisps and grudgingly we were given a few nuts. Tip: When offered the choice of drinks or points, we tend to check first how many drinks are on offer. As a rule, if two drinks are offered, we take them, but if it's only one, we take the points. There was a note in our room, offering us the option of a drink on the house if we didn't have our room cleaned. Given our less than friendly experience in the bar, we opted for a clean room. 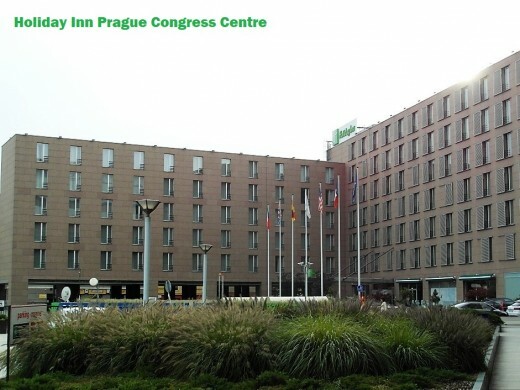 If you look at a map of Prague, don't be put off by the impression that the Holiday Inn Prague Congress Centre is a fair way from Prague center. 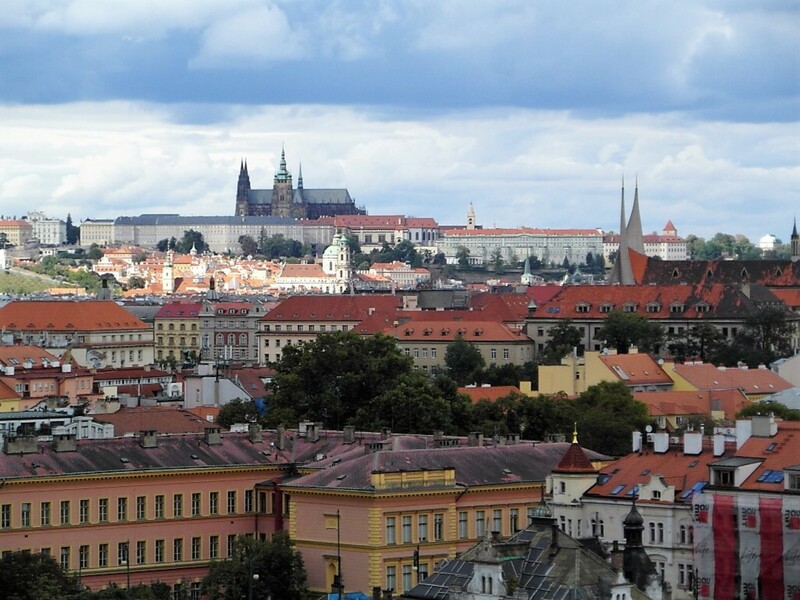 In fact, Prague is a reasonably compact capital city. 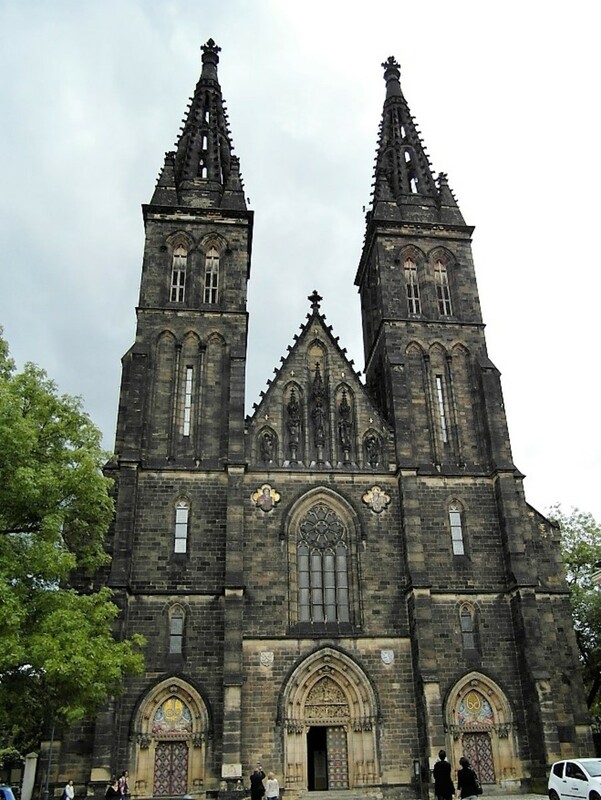 The hotel is 5 Minutes walk from the metro station at Vysehrad. From here it is possible to take the metro into the center of the city in just a few minutes. 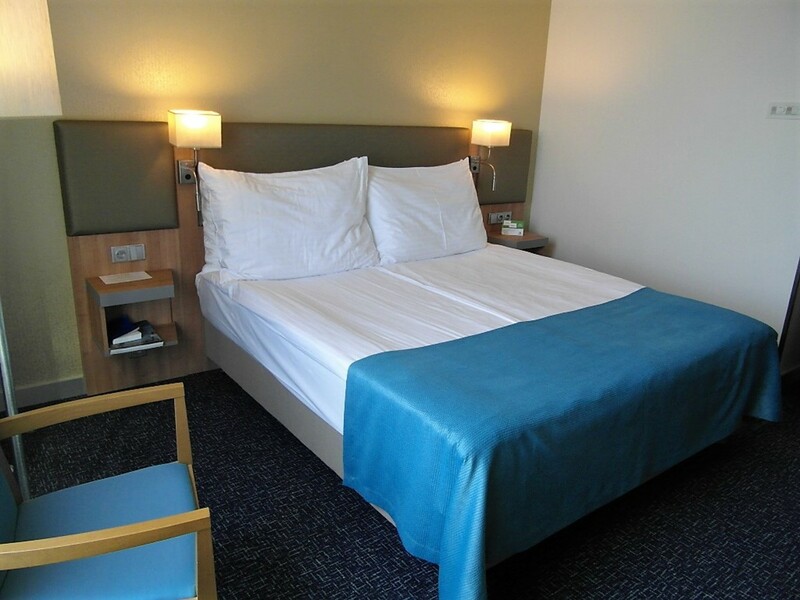 The hotel is just over 2 kilometers south of Muzeum metro station, at the top of Wenceslas Square. Trains are frequent and tickets are relatively inexpensive. We used to purchase tickets from the newsagent's stall at the station or, for the braver travelers, there are self-service machines. The metro system, with just three intersecting lines, is much easier to navigate than those in other European capital cities. Tip: To avoid on-the-spot fines, always remember to validate your ticket before boarding the metro. If you prefer a transport-free day, another option is to take a walk around the local area and explore Vysehrad, translated as High Castle. This is the area of Prague first occupied by the Slav tribes and is located a few minutes walk from the hotel. 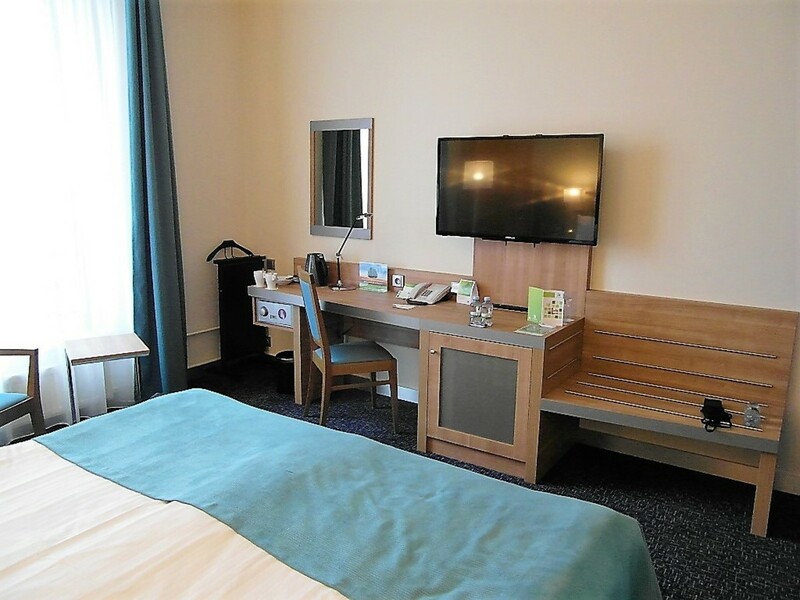 After four nights in three central Prague hotels, we returned to the Holiday Inn Prague Congress Centre for the last three nights of our stay in the city. Having had a good experience the first time around I was a little wary of how a second visit to the hotel would work. We checked in at 12.30pm, once again a little early, but we were pleased to find a room ready for us. We were told that we had been given an upgrade, but that there were no executive rooms available on that Tuesday night. The customary drinks offer or welcome points offer was made and we were assured that we could still get access to the executive lounge. The second-floor corridor contrasted strikingly with that of the fifth floor. It was very ordinary and dated, with orange walls in different shades and a red and orange carpet, which was marked in places. Although the door to room 230 was unlocked with a touch of the keycard, it still had an old fashioned round chrome doorknob and a keyhole. There was also a burglar chain for added security. It was a large room, with plenty of floor space, despite there being two double beds in the room along the right wall when we arrived, due to a sofabed being laid out. Handy if you have had an argument I guess, but for a couple the use of a sofa is preferable. The bathroom door was immediately to the left. The ceiling of the first section of the room up to the bathroom wall was lower to accommodate the air conditioning vent. On the far wall, there was a tall window with a side opening. It was partially covered outside by a decorative metal grille. A fitted wardrobe was located on the same wall as the main door. It had a single sliding mirrored door. There were four pale wood narrow shelves with additional storage space below them and a wider shelf across the top of the wardrobe. A narrow hanging space extended to the carpet and there was a shorter hanging space towards the wall with a shelf above. The sofa bed/futon had an unusually high and sloping back. 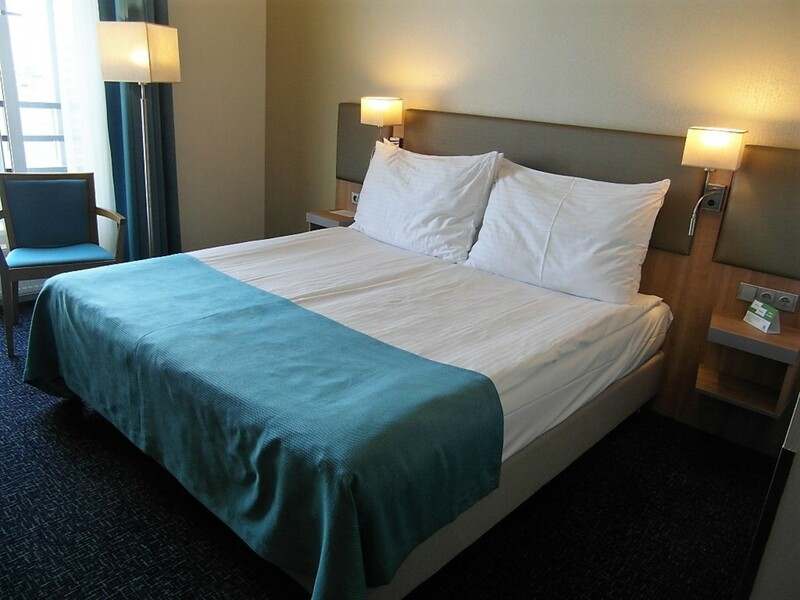 The bed was made up of two single bed bases and mattress, held together with one large sheet. The pillows were large. The long worktop along the opposite wall had several scratches on its surface. At the left-hand end, there was a double shelved unit below the worktop with a sliding wooden door to conceal the safe. Further along, in the corner there was a tall cupboard, concealing the minibar. Two walls were in shades of grey, as was the sofa bed. The other walls, in cream, were marked. The carpet was in a dark grey pattern. An armchair had a grey frame and grey padding on the seat and back. A black swivel office chair was a little stained. The skirting board was a silver color. The bathroom door had a chrome strip across the middle, which was marked and the round chrome doorknob was dented. Two side panels of the wardrobe were in opaque grey. The wardrobe frame was dark grey. The low hung ceiling was painted pale grey, but the larger higher ceiling area was white. The furniture was in a mixture of colors. A bedside cabinet had an orange frame with a pale wood front on its drawer, mottled beige marble top, and a blue/grey wall backing. This was repeated on the other side. A grey based lamp had a cream shade, which was cracked in places. The headboard was in pale wood. Sheets and duvets were white with an orange runner across the bottom. The bed bases were light grey, with pale wood square legs. There were full-length net curtains at the window, as well as lined blackout curtains in cream. A silver-colored board was above the window. The worktop along the wall facing the bed was orange framed with a pale wood front and top, resting on a grey metallic one. The backing was grey. The tall cupboard in the corner also had an orange frame with a pale wood front, chrome vertical handle and a mottled marble effect top. The backing was in a dark grey. There was a modern piece of wall art on the wall by the mini bar in black and red and chrome edging on the corner of the nearby wall. There were light switches by the bed, as well as the lamp either side and a plug socket. There were additional sockets by the desk. A standard lamp by the armchair matched the design of the bedside lamps. There were two lights set into the ceiling, one in front of the wardrobe and the other near the door. The air conditioning control was on the wall near the mini bar. We found it noisy when in use. There was a single pair of slippers in the wardrobe, as well as a shoe polish sponge, shoe horn, shoe polish glove, sewing kit, and laundry bag. There were eight hangers in total, three of these were for trousers. A chrome folding black webbed material suitcase stand was useful. There was a telephone by the bed, as well as a pad and pencil. A large square mirror on the wall behind the desktop further emphasized the generous proportions of the room. There was a Grundig alarm clock/radio on the desk as well as a perspex leaflet holder. A large flatscreen TV stood on a black rectangular plinth. The safe was operated with a keycard, but we found it a little temperamental, which was a concern. The mini bar detected anything being removed. There was a kettle on the cupboard top with a bowl containing tea, coffee, and creamer. In addition to the tea/coffee making facilities, we found water, wine, nuts, dried fruit and chocolate in our room later in the day, similar to our experience in the first room. 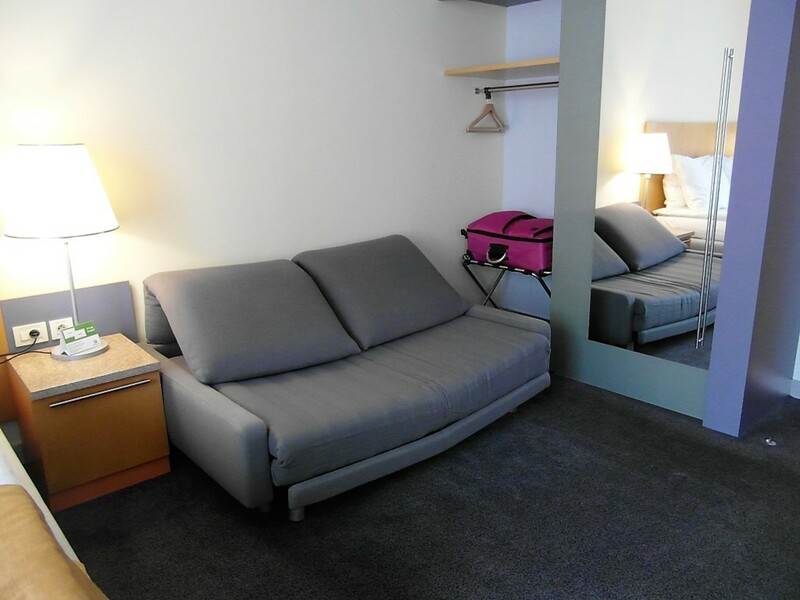 In spite of its size, we found the quality of this room disappointing. It had a dated appearance and was showing signs of wear and tear. 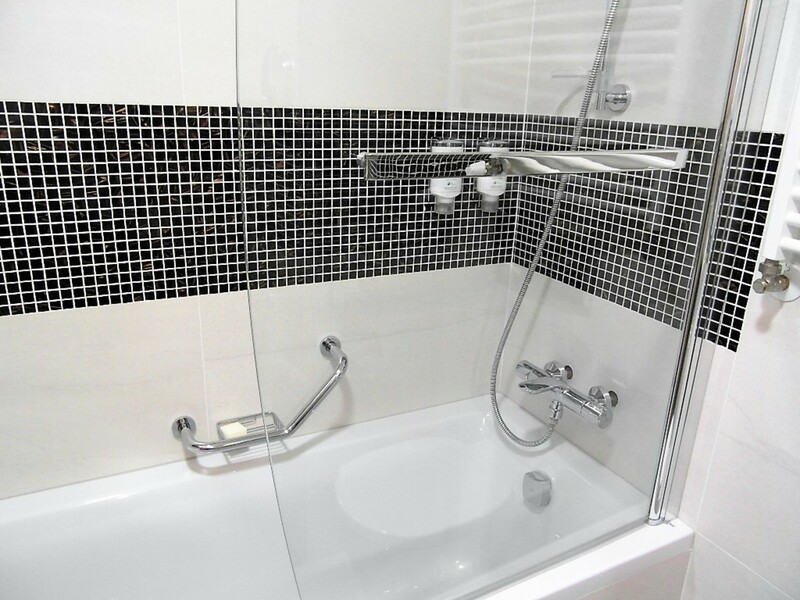 Grey was the dominant color of the medium-sized square matt floor tiles and the similar gloss wall tiles along the bath and halfway up the wall, where they gave way to white ones. The top row of tiles was missing, with flaky white paint there instead. The bath on the right was very small, at half or two thirds the normal size. It had a seat or raised area, so there was no hope of an adult stretching out in there and it appeared dated. There was a shower running off the taps with a flexible hose on an adjustable chrome bar. 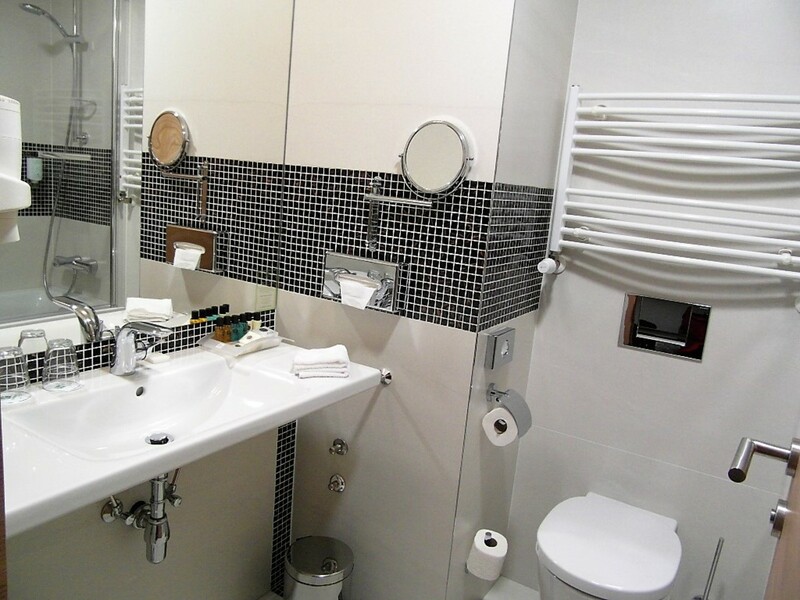 A chrome towel rail was over the bath and there was a grab handle with a toiletry rack by it. The whole area was enclosed by a white double shower curtain in a square pattern, hanging from a curved chrome rail. The wall-mounted toilet looked slightly out of place, as it appeared more modern than the rest of the bathroom suite. Above it, there was a heated towel rail. The sink was located in an alcove to the left of the door. It formed a single unit with the white top. Behind it, there was a large mirror, with a strip light above it. There was a chrome-framed, wall-mounted shaving mirror on the right and also a chrome soap dish. Tissues were in a chrome container, mounted on the wall above the toilet. There were two tumblers by the sink. A small discolored hairdryer was attached to the wall and there was a shaver socket nearby on the wall. A shower mat was rolled up under the sink unit. There was a wall-mounted Lux branded shower gel dispenser by the bath. Toiletries on a plastic tray by the sink doubled in number while we were out. A liquid soap dispenser was mounted on the wall near the sink. There were two white flannels, two hand towels, two average-sized bath towels, and a floor mat. We requested bathrobes and slippers, which were in the room along with extra toiletries when we returned at 7.00pm. Dated and small are the words that best describe the bathroom in room 230. There were also ominous dark mildew marks on the ceiling. Our second stay did not start off well. The bedroom qualified as an upgrade on size alone, but the bathroom was a downgrade. The first thing the following day my husband went down to reception and enquired about the chances of moving to another room. The receptionist recognized the small bathroom immediately and was very sympathetic. Later that day we were able to move up to room 637. Tip: If you don't ask, you won't get. We had nothing to lose by asking politely if there were any executive rooms available the following day. It is in a hotel's interests to do whatever they can to keep their guests happy and in most cases, they do their best to accommodate the wishes of guests. What do you do if you are not happy with your hotel room? Cause a scene on reception. It was a case of spot the difference between room 637 and our first room on the fifth floor. Apart from being a floor up and the room being the other way round, they were almost identical. There was no inter-connecting door this time and the small blue cushions were absent from the bed. This was identical to the one on the fifth floor. There was only one bathrobe and a pair of slippers, but we were soon supplied with another set. Having checked in again, we qualified for welcome points or drinks. We chose the latter and our experience was very different from the first time around. This time, in deference to my husband's brand membership status at the time, our choice was much wider. We ended up with a pina colada and a gin and tonic, as well as olives and peanuts. This was a definite improvement on the surly service of our first bar visit. The rating for this hotel was a tough decision. In fairness, it just scraped into the 4-star category. 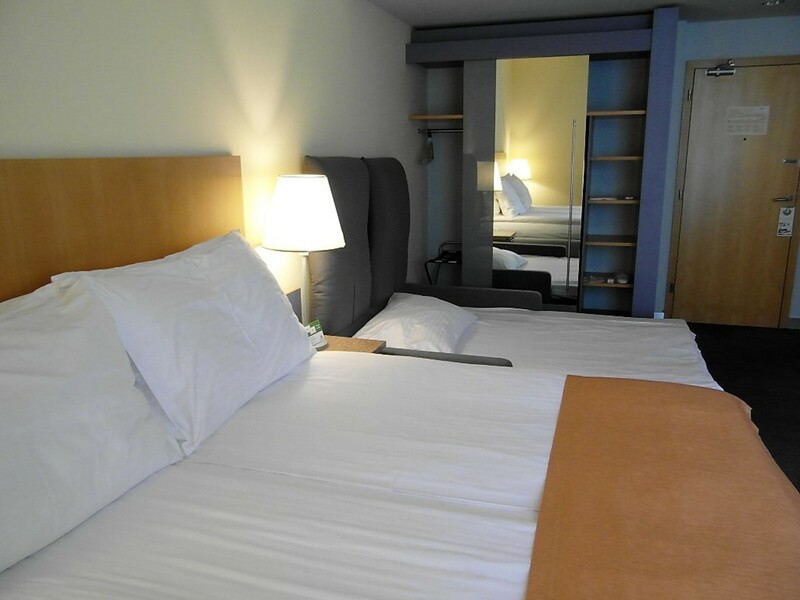 Our stay was not perfect, but in most instances, staff did all that they could to be helpful. They were not to blame that the hotel was full when we checked in the second time around. Upgrades can only be given if they are available. The hotel rooms have been gradually refurbished and I have every hope that the second floor will be done in the near future if it has not already been done. In fairness, access to free food and drink in an executive lounge, a rare bonus in a Holiday Inn, can count for a lot in improving a hotel's rating. Holiday Inn Prague Congress Centre served its purpose for us, as a comfortable base for exploring this fascinating city. Thank you very much for your comment. Peggy. We have stayed in Holiday Inn hotels many times, but, whilst following certain brand standards, no two hotels have ever been identical. 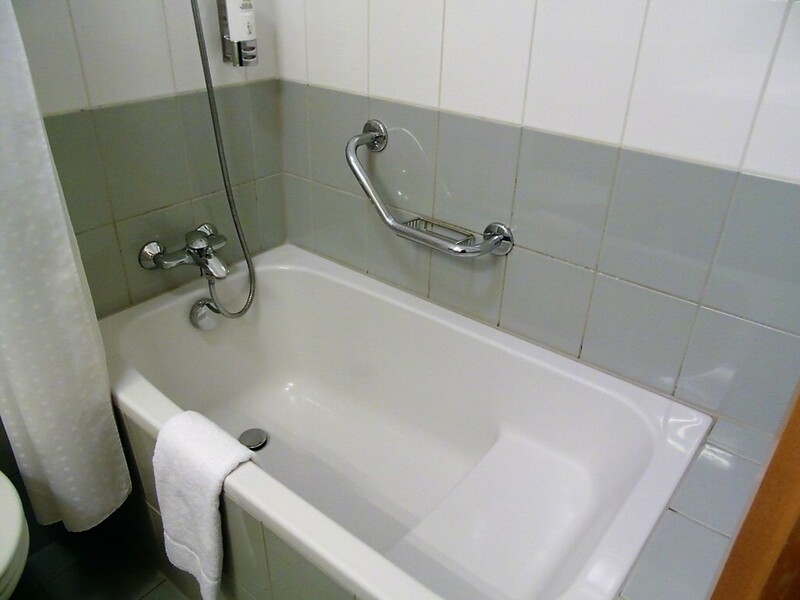 You certainly gave us a good explanation of what we should expect if ever using this hotel in Prague. It was very thorough. Thanks! Thank you for your comment, Babu. I used to write for a UK based site. My early attempts at writing hotel reviews were criticised for being too brief. So I went to the other extreme, putting in as much detail as possible. I have a friend who takes her clothes, packed in her suitcase on hangers, because it makes it easy to unpack and because there are often not enough. As a result I tend to notice hanger numbers. I appreciate being able to make a drink in the room. The day starts off better with a cup of tea. It's useful to know what the hotel provides in case we need to bring supplies with us. I find that most hotels are also very helpful at replenishing the drinks they supply if we ask. Do you have any suggestions on how I can improve my reviews? Are they maybe too detailed? I am always open to advice. 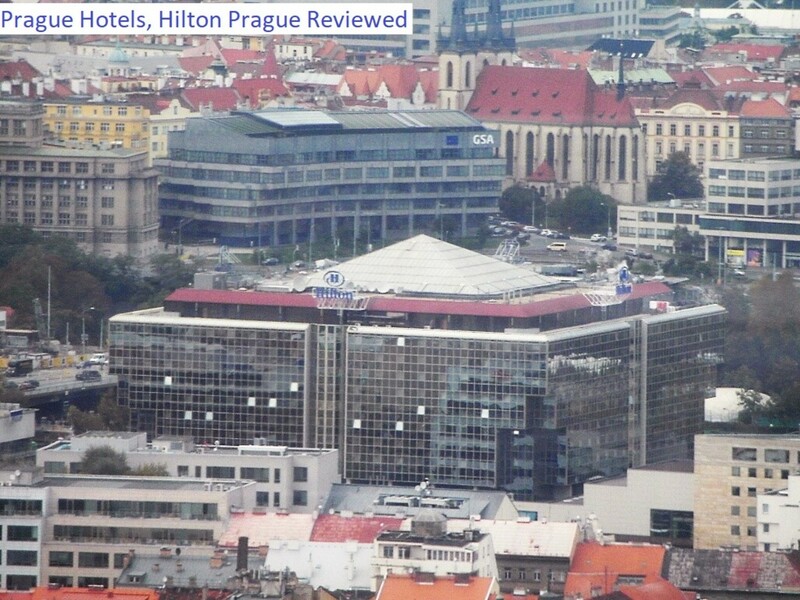 It was a very detailed review of Holiday Inn Prague Congress Centre. You have covered minute details like the number of hangers and the refreshments available. Every small thing matters when we are on a holiday. That is fascinating about the Holiday Inn name history. That's right, Robert. Broadly speaking, Holiday Inn Express is 2 star (though sometimes 3 star), Holiday Inn is 3 star (very occasionally 4 star), Crowne Plaza is 4 star and InterContinental is 5 star. Thes are all within the IHG (InterContinental Hotel Group) along with several other brands. I find the Holiday Inn history fascinating. I used to write a little about it on another site I wrote for, but my first hotel review here it was deleted. I think information about the brand was seen as too spammy. All the same the start up of Holiday Inn in 1952 in the States, with the first hotel named after the 1942 film as a joke and then the link later with a UK brewing company dating back to 1777 is fascinating. Is Holiday Inn a mid-range hotel chain? Prices between the economy hotels and the upscale hotels? We have visited many Holiday Inns, many in the UK, but also quite a few in Europe. It is interesting to see the variations within the brand.They all have many similarities and, in the main, adhere to brand standards. But no two hotels have ever been identical. The hotel information is very good I think even for people who aren't going to the Czech Republic. It tells people who don't travel much what to look for. Thanks very much for your comment, Robert. I appreciate you stopping by. Another detailed article about visiting the Czech Republic. Anyone planning a visit to the Czech Republic for the first time should read your series of articles. Great going. Thanks very much, Arthur. When I eventually get round to it, I will ask your advice. No problem, if in the future you would like any advice or recommendations on suitable hardware and software for analogue to digital conversion just drop me a line; and I'd be more than happy to try to help. Thanks for the information about digital conversion of VHS. It's a job that nèeds doing when I get round to it. I figured that there should be a device out there somewhere. I have reverted to still photography for the time being, which thankfully still keeps me behind the lens. Occasionally, if there's a festival or activity worth filming I might flick to video mode, but like you say, there's more stability in a larger video camera. We did contemplate using the boat trip to get to Polperro, but the timings didn’t give us the flexibility we wanted; so we opted to drive instead. And yes, the village is lovely, well worth the journey. You are right; cars are banned (discouraged) from the streets of Polperro; unless you are a local, or for deliveries. Although the closer you get to the harbour (just 10 minutes’ walk from the carpark) the narrower the streets get, so a point is reached where it becomes too narrow for a car. Likewise, I’m also too shy, and therefore quite happy to hide behind the camera. Shame about your video footage not making it to the digital age; but all is not lost. I had the same problem in the early days, so I bought an ‘Analogue to Digital Converter’; a simple and relatively inexpensive box that plugs into the back of an old VHS player using the old SCART cable, and also into the back of your computer with modern cables. Then with the Analogue to Digital Converter plugged in all I needed to do was press play on the VHS recorder and using video capture software on the computer e.g. Pinnacle Studio, press record. Then, once the VHS taped finished playing I had a digital version of the recording on the computer. I haven’t used the device in years, but I didn’t through it away, I just put it in the loft to collect dust (along with the old VHS player) just in I or someone else in the future has a need for it. We went to Looe many years ago, but didn't make it to Polperro. I was also told that a good way to get there was via boat trip. I was surprised to see film of cars there, as I thought they were banned from the streets of Polperro beyond the car park, but must have misinderstood. It looks lovely and I can understand why it was recommended. The other issue was that my Panasonic, though good for adding titles etc. used to feed into my video recorder so I have loads of old family videos. The Samsung used to go onto DVDs until the DVD recorder broke so the footage then went onto VHS. I never made it into the digital age I fear. Never been to Cockington, but we’ve been to all the surrounding villages at one time or another. Although having had a look at it on Google Earth, I love all the ‘Thatched Roofs’, so next time we’re passing through the area, it would make a great place to stop off for a break. Another picturesque village, if you haven’t been there, is Polperro, Cornwall; the harbour is just 10 minutes’ walk on the flat (no hill) from the carpark. We too love the Cream Teas. Whenever we visit Devon or Cornwall we always make a point of treating ourselves to their Cream Teas; albeit as I don’t drink tea I substitute the tea for coffee. Cool. It’s nice to speak to someone else who’s used big video cameras for their holiday videos. Did you ever put any of your holiday footage on YouTube? As you noted; keeping the filming more steady than can generally be archived by a lightweight device like a smartphone is why I prefer to use a bulky, heavy camera (as cumbersome as it is); apart from which we are one of the few families who still don’t have smartphones. I don't recall ever going to Clovelly, but might well have been taken there as a young child. It is definitely on my list now though. It reminds me a little of Cockington, just outside Torquay, where we took the kids for a horse and carriage ride and the annual holiday cream tea many years ago. I thought your filming was too steady for a smartphone. I used to use a big Panasonic video camera, which was replaced with a Samsung. Since the kids stopped coming on holiday I lost the excuse for filming. So I stick to still photos mainly now. Yep, these old fishing villages weren’t built for cars; which didn’t even exist in those days. And some, like the famous Clovelly Village in Devon (the only privately owned village in the UK), kept in the style of a Victorian Village, isn’t even suitable for the horse and cart. In the past, for car journeys, I used to use my large and heavy Sony Video Camera (that I still use when filming our holiday trips on foot); but it was rather cumbersome and difficult to use when the car is moving. Until the Christmas before last, when my wife bought me a dash cam for the car; NextBase 512GW, a mid-range model that does high quality 1440p HD capture. That reminds me of some trips we have had. It's always good to park as near as possible to the front to avoid a long hike back up hill to the car, but it can have its drawbacks. I don't think these villages were originally built with cars in mind. How do you shoot your film? Is it on a dash cam? Thanks Liz. Yeah, I don’t drive, so as a passenger I can sit back and enjoy the ‘Adventure’/’Journey’; so to me navigating the narrow Cornish Roads is an excitement. While, my wife, as the driver, has all the stress of driving; and like you, she’s not particularly fond of the Cornish Roads. Although it doesn’t stop her from pushing her limits when she’s keen to get to a particular place e.g. on our visit to Polruan Fishing Village (on the same holiday in Cornwall), we had a choice of either parking in the Public carpark above the village and walking down, or driving down to the fishing port (docks), where there was limited parking. She chose the latter, but found manoeuvring on the narrow streets at the bottom too difficult for her, and almost got stuck; so we drove back up (after she struggled to turn the car around on the narrow steep streets) and used the main carpark above the village. Thanks for your comment, Linda. It was a good base for exploring Prague and the free food and drink was a bonus. This review covers all the bases. It seems like it would be a decent accommodation even though there might be a few issues. Awesome description of this Holiday Inn. Thanks for your comment, Eman. I hope that my hotel reviews will help others too. Great video clips, Arthur. I thought you sounded remarkably calm in the circumstances and I sympathised with your wife. I hate those narrow roads. Thanks for your comment, Kenna. That seems to be the way to get the best out of your stay. There's not much point in putting up with less, but not saying anything and then moaning later. We can't expect hotel staff to be mind readers. If they don't know there's a problem, they can't try to fix it. An interesting article and very detailed. I enjoyed reading it a lot. It's very helpful. Thanks Liz, no damage to our car, surprisingly. I can visualise your incident. I guess you didn’t try driving down the track again after the cows made a visit (and paid their respect); which would have made subsequent visits, traipsing down to the beach with the kids and baby, quite a chore. Where our wing mirrors did take quite a bashing, but none the worse for wear, was all the narrow Cornish roads on one of our holidays last summer e.g. with all the hedgerows. Daily we met oncoming traffic where we or they had to reverse. The two most memorable incidences being meeting an oncoming lorry, and bus on another occasion. The lorry was the most vexing challenge of the two: Although my wife is a good (and safe) driver, she’s hopeless in reversing; so when we met an oncoming lorry, our son had to take over the wheel and reverse up the narrow Cornish road for about 200 feet, to let the lorry pass e.g. I don’t drive. I always inquire about bigger rooms or bathrooms. If they are available, the hotel will accommodate. If anything is missing, like the second robe or coffee maker, I call the front desk right away. Your review is so helpful. I had my first experience checking-in at Holiday Inn Florida. The good thing about this hotel is their location. It's accessible to almost any establishments. Foods are bit pricey too like what you've said. A dinner coupon worth of $25 is only equivalent to a baby back ribs with rice and a drink. lol Their lobby area can hardly accomodate large number of guests. Overall, their facilities are still great. That's an interesting video. I hope there was no damage. It reminds me of a holiday we once had on a farm in North Wales. The farmland ran down to the sea, so with two kids and a baby we decided to drive down the track. All was fine until we returned from the 'beach' to the car to find the cows had paid a visit. It was a little muddy and the wing mirrors had been knocked. Yes, we tend to avoid the school holidays for the same reason, much cheaper accommodation; and likewise, we prefer self-catering (for the independence), although for three it’s not as economical as it would be for six. The only main area where we diverge from your holiday plans in this respect is that an indoor pool isn’t on our list of requirements, because in the event of rainy days my wife always makes a list of local indoor attractions e.g. castles, aquariums, museums etc., that we can visit as an alternative to the beach or sightseeing. Yeah, the vehicle access to Red Mill was five miles of dirt track across fields, with drainage ditches on either side of the track in places; the whole journey would take 20 minutes. The inland island is reclaimed land (6 feet below sea level) so it has to be constantly drained through a network of drainage ditches from where the water is pumped into the surrounding rivers. The Victorians built windmills to pump the water from the land (hence Red Mill); these days it’s all done with electric pumps. The most harrowing were the ‘black bulls’ that were notorious (according to the guest book in Red Mill) for blocking car access. On our first day out, they blocked the road and tried to push our car into the drainage ditch; until after 10 minutes one of the farmers came to our rescue, and showed us how to handle the bulls. Thanks for your comment, FlourishAnyway. Well-travelled relatives had recommended Prague as a great place to visit, so it had been on our list for a while. We were looking to use a couple of free night hotel vouchers and both brands had hotels in Prague. Hopefully I will get around to writing up reviews of these hotels at some stage. You give a detailed account. Certainly the one room was superior to the other. The bathroom in particular differed in quality. What drew you to Prague? Thank you for your comment, Alicia. I often find that I have to search around to get all the information I require from reviews. So I try to give as much detail as possible in hotel reviews. It also historically goes back to a previous site I used to write for, where detail was highly demanded. You include so many details in your hotel reviews, Liz. They are a wonderful resource for travelers. Thank you very much for your comment, Dora. I started out writing hotel reviews on a UK site. The feedback was that they weren't detailed enough. So I guess I go to the other extreme. Your conclusion that the hotel served your purpose is redeeming. It's great that your account is so detailed for both visits, and I appreciate that you tell it plainly the way it is. You're very observant and your readers benefit from your honest view. Good read! We used to do lodges and static caravans when the kids were younger. At first out of season and then searching around for the best deals in the school holidays. We used to favour parks where there was an indoor pool, as at least it was something to do in bad weather. Latterly we did venture across the Channel where we found more for our money. Self-catering was the best option for a family of six. Now back down to two of us, we tend mainly to fly and very occasionally take the car over. Avoiding school holidays has made a big saving. The windmill looks like a great find. I was relieved to see your car parked by it, as from the initial description, I wondered if there was vehicle access! I’ve always wondered how camper vans fair during the holiday season; yes I can imagine the campsites would get full at the peak of the season. Years ago, we used to hire a static caravan for a week on the holiday campsites, because it was the cheapest; my wife used to shop around on the Internet over six months in advance to find the best bargains. Then about ten years ago they became a lot more expensive; and holiday cottages became cheaper! My wife has a knack of finding bargain (and unusual) holiday accommodation, with good reviews, and we are never disappointed e.g. a cottage for £300 a week when all the others in the area are typically £500. The best holiday accommodation my wife found in England was an isolated windmill on an inland island 5 miles across farmers’ fields from the road; very isolated, but plenty of wildlife. My parents used to take a camper van down to the South of France. They favoured the N roads and used to stop whenever they had had enough of driving. Although I do recall that this did not work out well for us in peak season around the Italian lakes, as we went from camp site to camp site which was full. Yes I can imagine your friend’s difficulties in eating out in France, with their son’s nut allergy; and sympathies with them. Although we’ve been holidaying in France every summer since the mid-1990s, our French is still very poor. Albeit we’ve got used to understanding the French menus e.g. cheese = Fromage; bread = pain etc. Albeit, one of our favourite meals when eating out in France, omelette and chips, followed by banana split, are easy to spot on the menus; omelette et frites, and banane split. When we take a holiday in southern France, we do pre-book the channel ferry, and the holiday accommodation at the other end, but by splitting the journey from home to the holiday cottage/caravan over two days (and then 2 days coming back), and not pre-booking the hotel overnight stop means we can meander down, and it extends our holiday to almost two weeks. In getting to our destination from the ferry port, we don’t use the French toll roads. The first thing our satnav asks when we get off the ferry is whether we want to avoid the toll roads, and we always say ‘yes’. Then we can take a leisurely meandering journey down, passing through the towns and taking a detour to explore the villages whenever we want a break from driving. Thanks for your comment, Southern Rose. The poll capsules are useful for adding a bit of reader participation to articles. Love the article, Liz! It’s so detailed, the tips are helpful and the photos were awesome! I love the voting part, btw. Thanks for sharing your Prague journey. Best regards. Thanks for your comment, Gregory. I am glad that my friend's tip has come in useful for you. 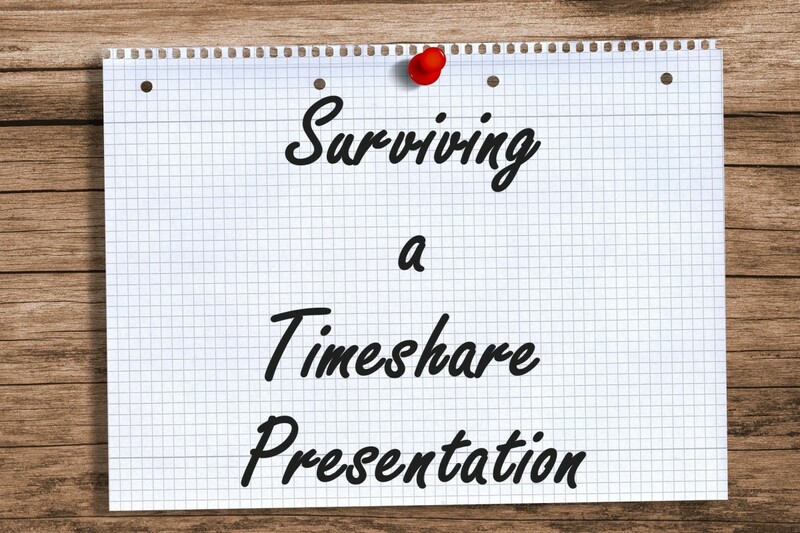 I think a lot of hotels cater for the short business stays, rather than for longer vacations. So hangers are often in short supply. I find the most challenging ones are those where the hook stays in the wardrobe and the rest of the hanger has to be slotted in. It stops people taking them, which probably happens, but there's an art to slotting them back together. Thanks for your comment, Poppy.This was all from the same trip. 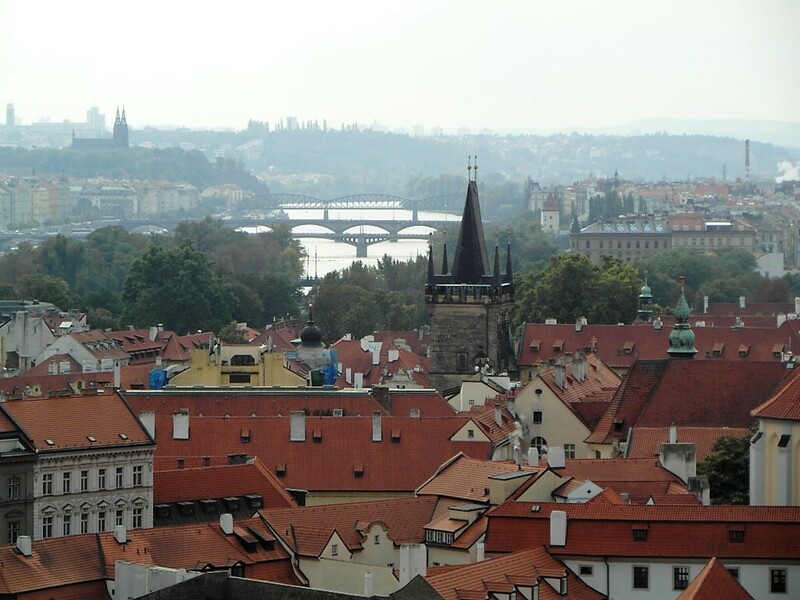 Prague was highly recommended to us by someone, who has travelled widely. But it exceeded our expectations. Liz, thank you for another meticulously-written article. Liz, thank you also for the fantastic tip about hangers. I took some shirts to the dry cleaners/shirt laundry today and I intend to save the wire hangers for future use, just in case. I remember that you mentioned this very same subject in another article. What an excellent and detailed review of this hotel. You really love Prague! Did you go again or are these articles all from the same one or two trips? Thank you for your comment, Pamela. When looking for a hotel I sometimes get frustrated that there's not enough information. I therefore go to the other extreme when writing hotel reviews. Prague looks like a very interesting city to visit. Your review of the hotel rooms was very thorough and interesting. Thanks for commenting, Arthur. That's an interesting way to cross the Channel. We have done similar trips, although we tend to pre-book. That's an impressive Kyriad you found there. We have stayed twice in the one in Calais, which is cheep and cheerful, but nowhere near as impressive. We also stayed near Rheims in one. We have friends, whose son has a nut allergy. You can only imagine how difficult it was for them to eat out in France. 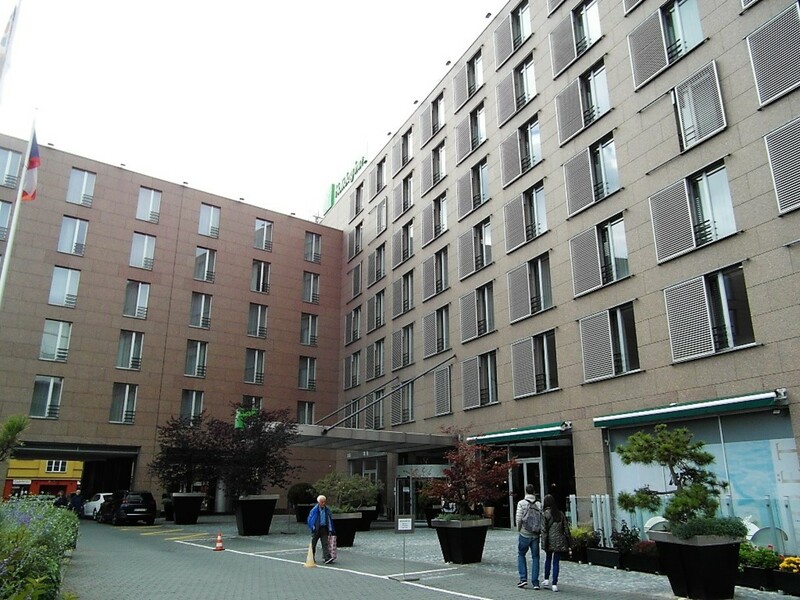 A very comprehensive and informative ‘Review’ of the ‘Holiday Inn’ you stayed, in Prague; an interesting read. When we’re on holiday we always go self-catering, but for long journeys, such as driving from Bristol to the Vendee Coast in Southern France (about 650 miles including the 90 minute fairy crossing) we like to drive leisurely (stopping to sightsee at picturesque villages en-route) and break the journey by stopping overnight before we reach our destination; and then finish the journey the following morning. We don’t make any pre-plans as to which hotel to stop at en-route, as we don’t know which route we’ll take or how far we’ll get e.g. the journey down (exploring) is part of the holiday. We get as far as we can go (at a leisurely pace), and then late in the afternoon head for the nearest town or city to look for a suitable hotel. Our criteria for a suitable hotel is one that is reasonably priced, and of a reasonable standard; and although its pot luck, so far we’ve been very fortunate in finding such gems. For example, when on our way to La Palmyre, France, we took an overnight stop at Nantes, and stumbled across ‘Hotel Kyriad’, a beautiful Hotel, with quiet scenic grounds and a very friendly resident dog; and it only cost us about 60 euros for two rooms. Like you (apart from breakfast) we prefer to eat out, rather than pay the extortionate hotel food prices. Although, in France, finding somewhere to suit us can be a marathon as my son and I are vegetarians and my wife doesn’t like spicy foods. Albeit, in France we usually find 1 in 10 restaurants/cafes do meals we all like, so half an hour wandering around looking at the different menus we usually find somewhere that does something like omelette and chips. Thanks for the comment, Bill. I guess tourism has probably kicked off big time in Prague since the 1990s. The Holiday Inn looked to have been built shortly after the Congress Centre. While we were there I noticed a few smaller hotels in older buildings, but most of the international brands were in bigger and more modern buildings, a little out of the central historic area.